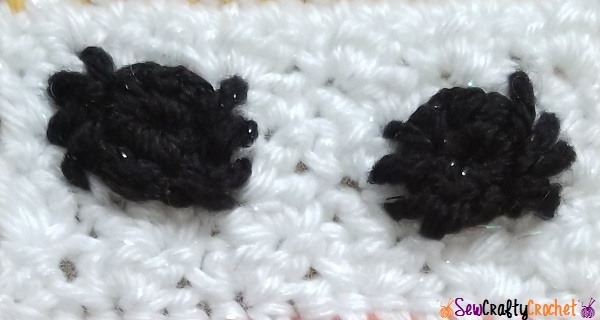 This scarf may look familiar since I have crocheted a scarf like this before. 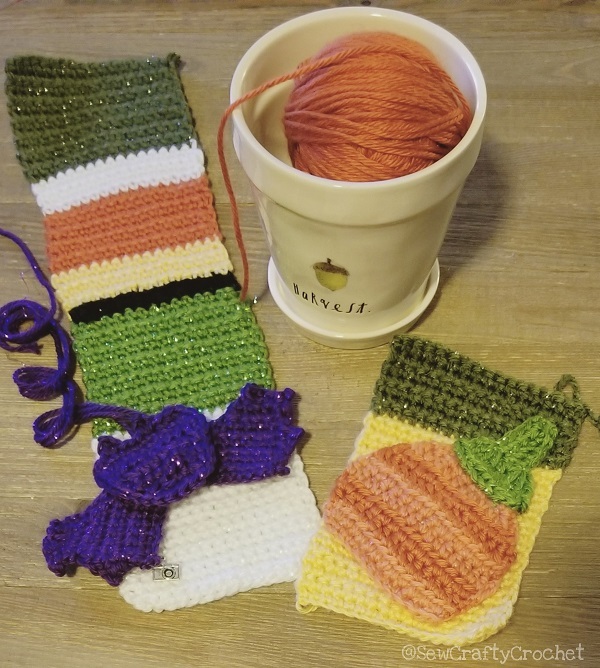 This time I decided to use sparkly yarn, so this scarf sparkles! 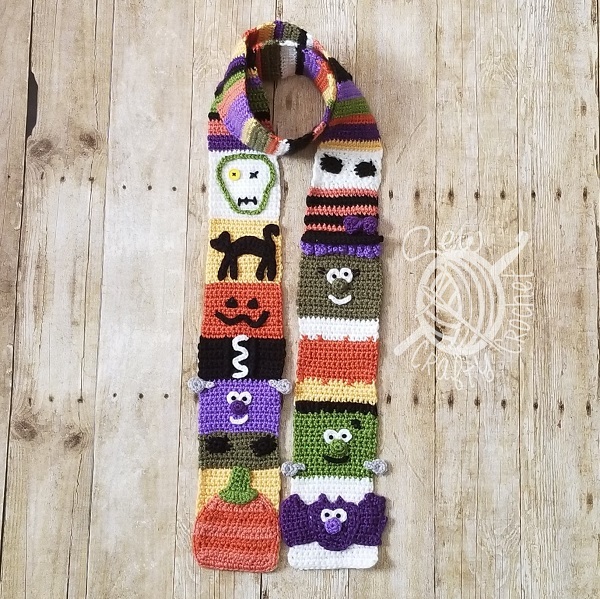 To create this fun Halloween scarf, I used the Halloween Sampler Scarf crochet pattern by Snappy Tots. 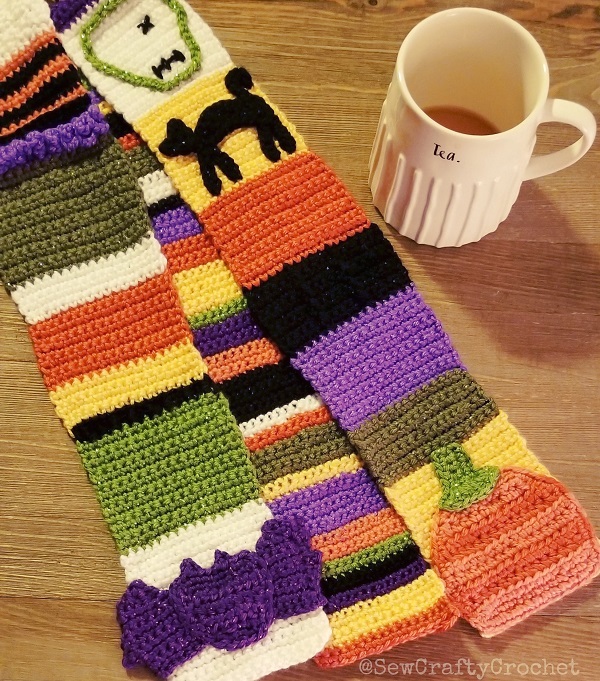 My favorite parts of this scarf are the Bride of Frankenstein and the Witch. I did make a few changes, but for the most part, I followed the pattern. For this scarf I used the following yarns: Red Heart With Love Metallic Olive , Red Heart With Love Metallic Light Grey , Cascade Yarns Hollywood 15 (Orange), Caron Simply Soft Pumpkin , Caron Simply Soft Party Black Sparkle , Caron Simply Soft Party Spring Sparkle , Caron Simply Soft Party Grape Sparkle , Caron Simply Soft Party Purple Sparkle , Caron Simply Soft Party Snow Sparkle , and Caron Simply Soft Sunshine . 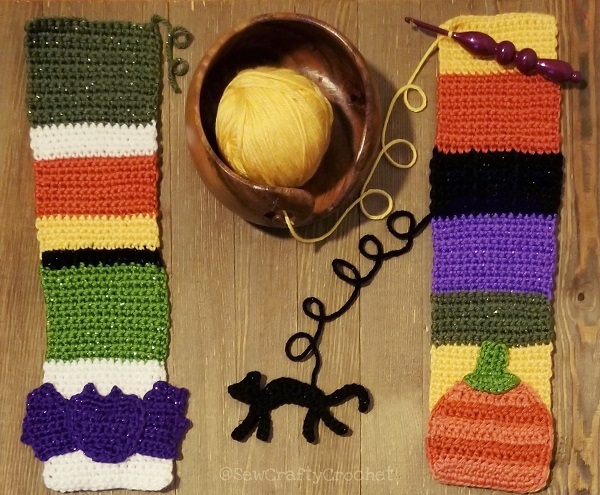 Then I got started on the body of the scarf. 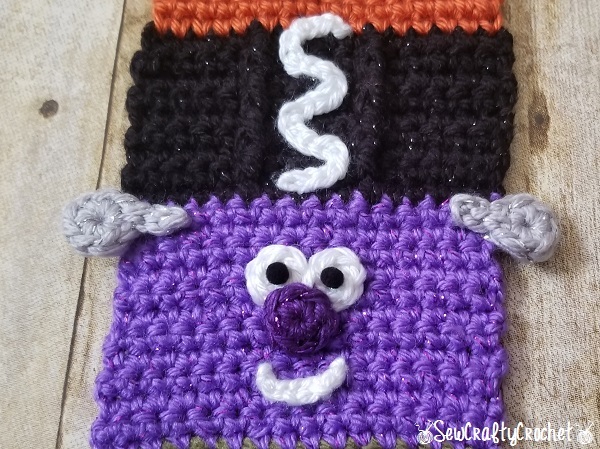 I created some of the scarf's Halloween applique characters as I went along as a break from crocheting the rows and rows of the scarf body. 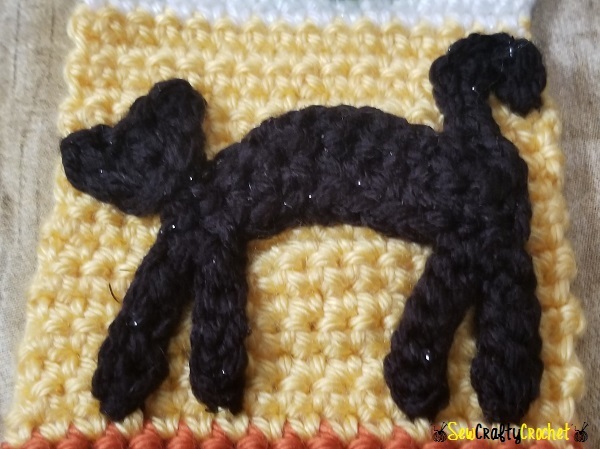 Black cats are a must for Halloween! 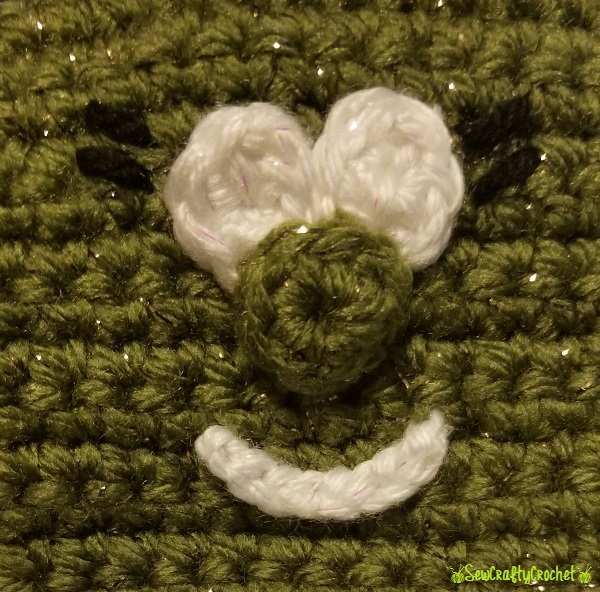 I sewed the kitty onto the scarf. 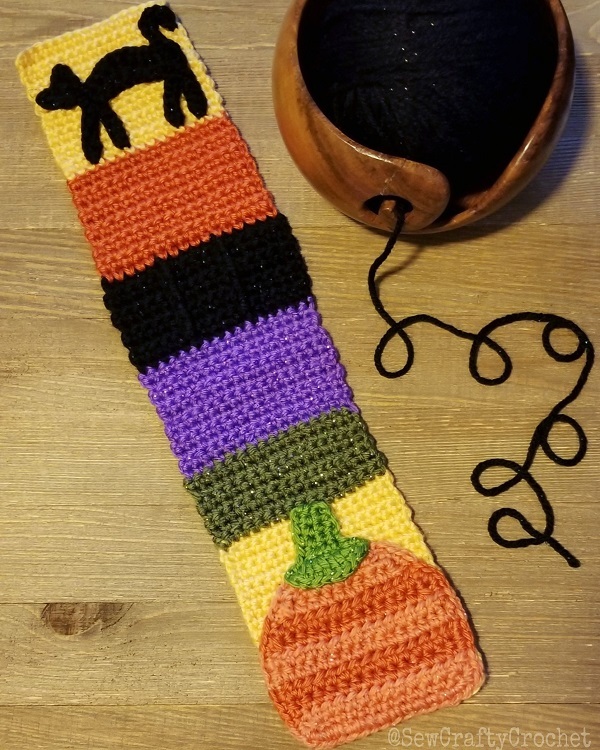 The middle section of the scarf is crocheted in stripes of Halloween colors. 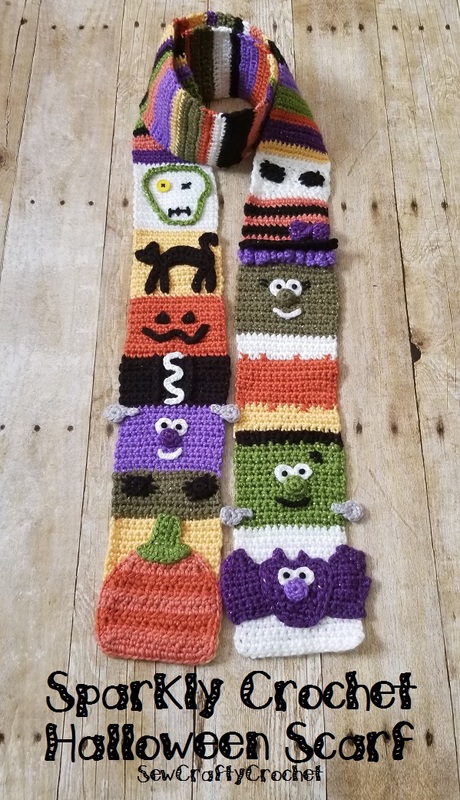 After finishing the body of the scarf, I added the Halloween characters faces. Here's the witch. 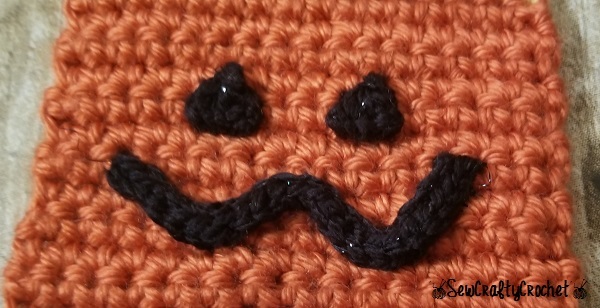 For the black part of the characters' eyes, I used black mini pom poms . 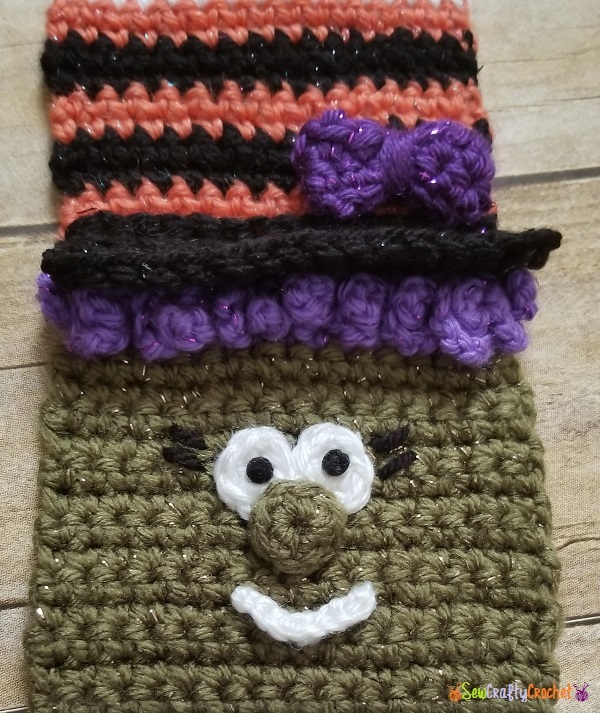 Here's the sparkly witch with her eyes, curly purple hair, hat, and bow. 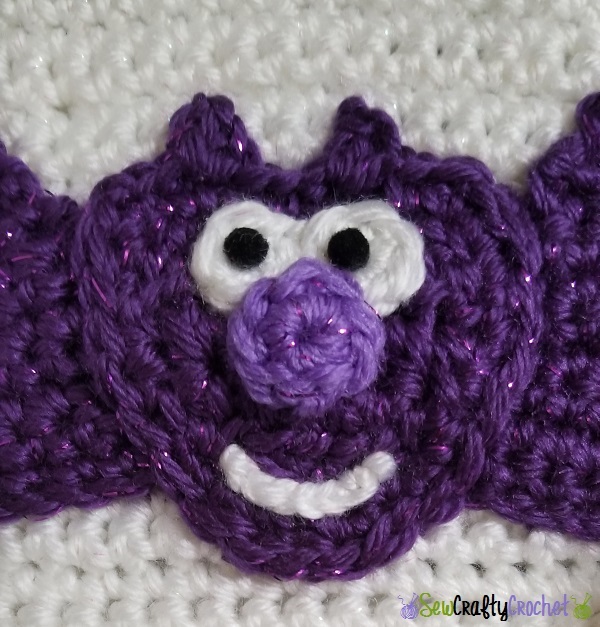 After taking pics of the scarf, I realized the bat didn't have a mouth, so I quickly added one. 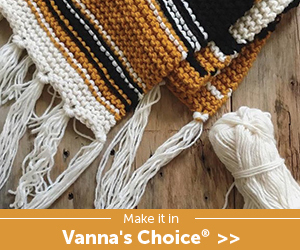 The part of the scarf that wraps around the neck features colorful stripes. 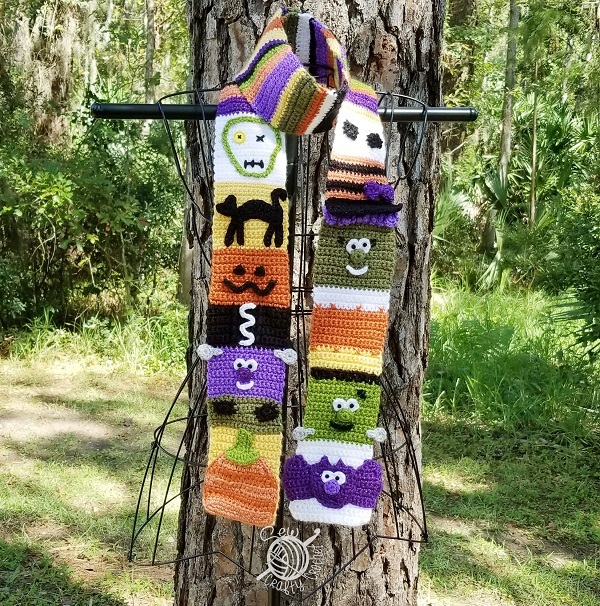 This sparkly and fun Halloween scarf is approximately 71½ inches long and 4 inches wide. 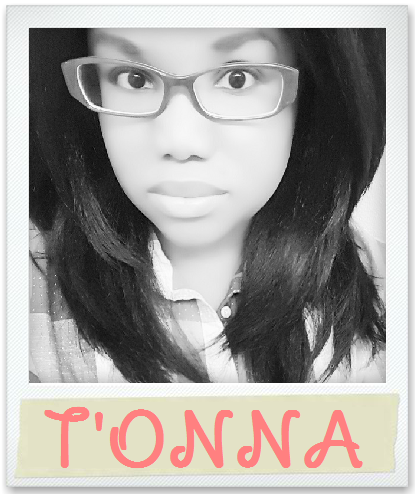 This scarf is adorable, T'onna. 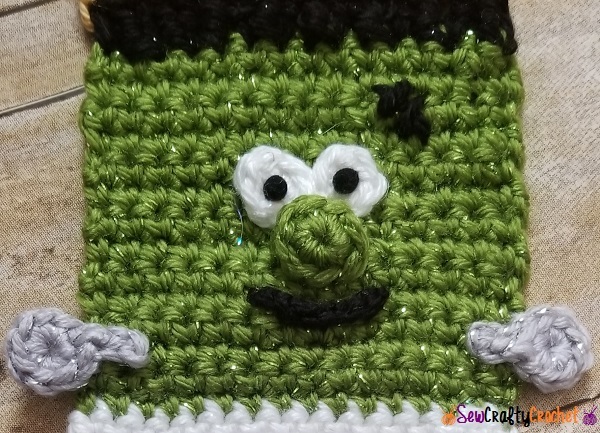 I love all the details for the faces! This is my co-host feature pick for tomorrow's Snickerdoodle Party. 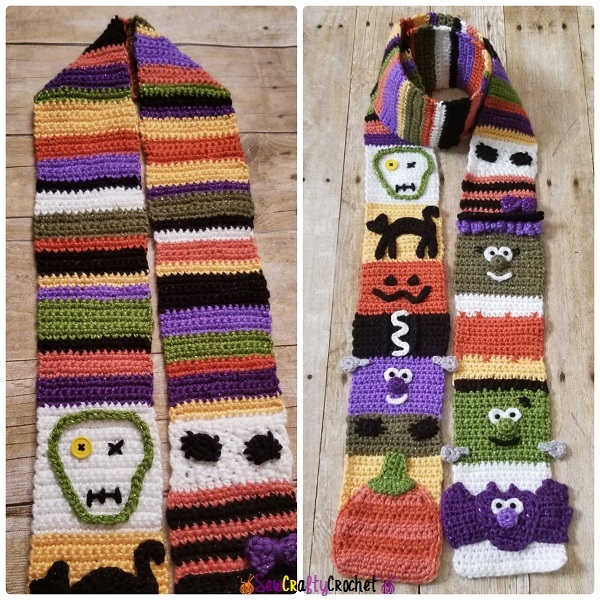 Super cute and fun scarf. You do beautiful work. 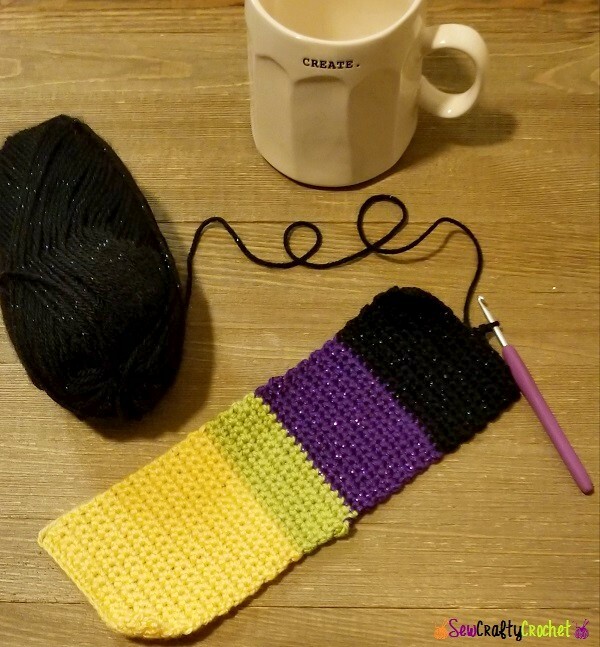 I am been wanting to try my hand at this scarf. 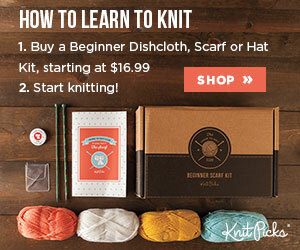 I have been eyeing it for a while...::sighs::... 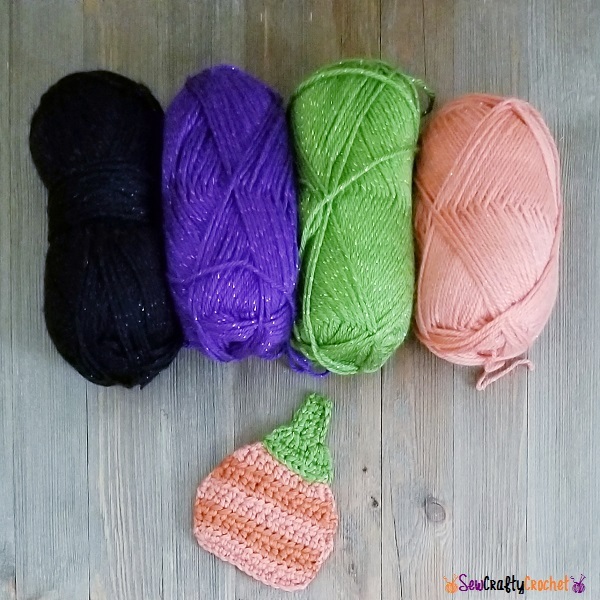 So many projects, so little time. 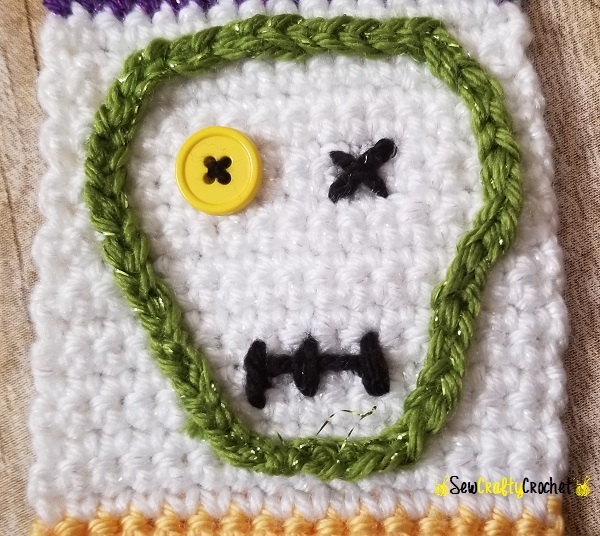 I love that you used glitter yarn in it - adds to the Halloween feel. 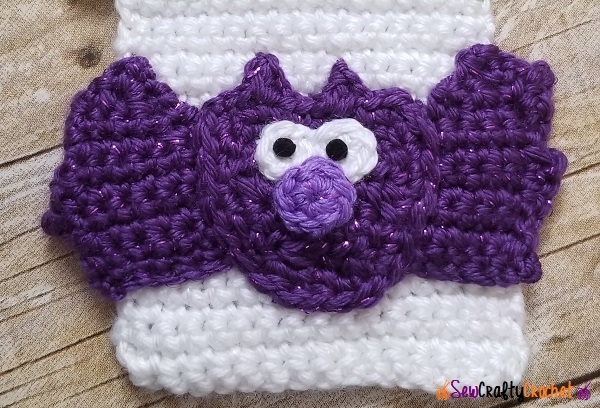 What a super scarf. 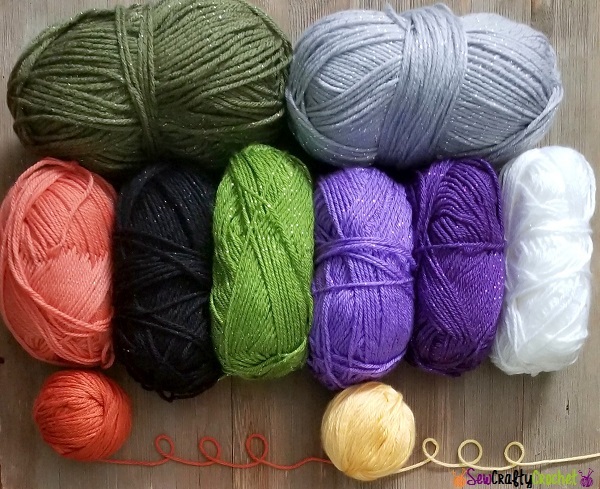 I love all the sparkles in the wool. 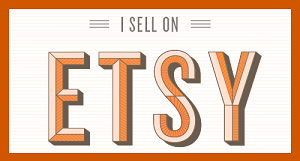 Thanks for joining my link party for October.